Bajaj Bearings Private Limited. Mumbai, INDIA is a manufacturer and Exporter of bearings under “Bajaj” Brand having the largest range of Automotive Bearings- Taper Roller Bearings (MM Series & Inch Series), Cylindrical Roller Bearings, Needle Roller Bearings, Spherical Roller Bearings, Water Pump Bearings, Deep Groove Ball Bearings, Angular Contact Ball Bearings & Bearings for Fork Lift in India. With an experience of over a decade, we have accustomed the trends, needs and wants of the customers and the industry. Our commitment to excellence has taken us many miles ahead of our competitors. We have a worldwide presence and have been exporting to the international markets. Bajaj bearings are today being exported to around 52 countries worldwide viz. USA, UK, Argentina, Australia, Brazil, Belgium, Bangladesh, Canada, Cyprus, Chile, Costarica, Colombia, Dubai, Egypt, France, Germany, Italy, Iran, Iraq, Ivorycost, Kenya, Mexico, Madagascar, Nigeria, Poland, Peru, Russia, Spain, Srilanka, South Africa, Saudi Arabia, Turkey, Tanzania, Uganda, Yemen, Zimbabwe etc. We are poised to provide you with the highest quality service available in the industry with both time and cost efficiency. Our passion drives us to grow for mutual benefit of our Organization and that of our Client’s by providing every single Bearing right from the Raw Material till the Packaging with Supreme Layers of Extreme Care, Durability & Resistance repeatedly. 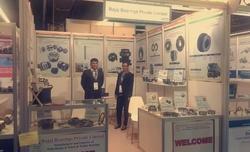 Bajaj bearings was founded in August 1996. With an experience of 21 years in this field, we have a reputation of being a reliable source. Our company is an ISO 9001 : 2008 certified by IQCS. From very beginning, We have focused on Quality & Technical development. Bajaj bearings are manufactured from bearing steel grade SAE 52100 (as per international standard), with Modern Technologies and Skilled workforce. The company manufactures a very wide range of bearings in compliance to the stringent international quality standards. We also develop and manufacture any new sample bearing received from our customers in 30 ~ 38 working days. We assure to provide highest quality service available in the industry with both time and cost efficiency. To Provide Bearings solution to Universal companies as per international Specification with outstanding Design & quality. Our people are our enduring Advantage, Accountability is clear and Personal, We Work and Win in Teams, We understand and respect our Customers and Consumers; and our Reputation is indivisible. We believe in “Pray as Though everything is depended on God" &” Work as Through Everything is depended on you"
Quality of our Bearings with flexibility to really & trust us that the Performance is guaranteed. We cater to Small, Medium, and Large Organizations all over the world. 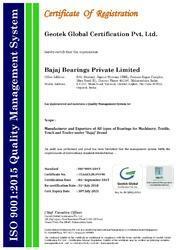 ISO 9001 : 2008 Certified Company. We welcome queries from Importers, OEMs and Buyers in Replacement Market regarding the details of our products and services. We assure to provide you the highest quality service available in the industry with both time and cost efficiency . We lay emphasis on continuous up gradation that reflexes our commitment of providing Quality as per the Customer’s Expectation within the appropriate Time Limit that gives back Flawless Performance. 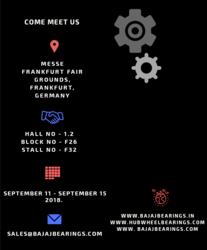 Please Note that Bajaj Bearings Parts (Bearings No.) is not original but perfectly Interchangeable with O.E.M. ones. All Original Equipment Manufacture's Name, No., Symbols & description used in this " E" Catalogue / Email / Quotation / Proforma / Images are for reference only.